You really do need a fun loving, car riding, grass rolling guy in your life, right? Boogie Pilgrim is all that and more! For starters, he is one handsome dude of a dog. 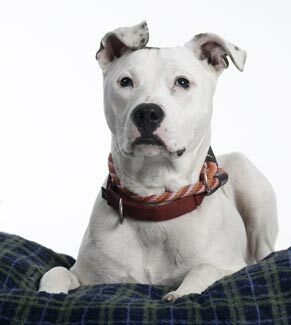 A beautiful white with some black beauty marks, Boogie Pilgrim is a 45 pound, one year old, Pitbull Terrier mix. He is working on his house manners and is learning basic training commands. He may look like a distinguished gentleman in his photo, but you should see him lolling on a comfy bed or couch. Boogie Pilgrim loves car rides and knows that his place is in the back seat, checking on the world outside the window. He's an outdoor boy and loves to roll in the grass. Fetch is his favorite game. Boogie Pilgrim is a young guy just finding his way in the world. All he needs is someone to love him and help him be the best dog he can be. If you think that someone might be you, contact Stray Rescue of Saint Louis at 314-771-6121. Boogie Pilgrim is calling their Pine Street animal shelter home for now. Founded by Randy Grim, Stray Rescue of St. Louis's sole purpose is to rescue stray animals in need of medical attention, restore them to health, and place them in loving adoptive homes. Virtually all of the pets they save have been abused and neglected. They've been dumped on highways, or remote country roads. Abandoned in public parks, empty houses and dark alleys. They've even saved dogs left chained behind buildings after their owners had moved away. He's a very handsome pup!